The 2019 Empire State Producers Expo will take place on January 15-17 at the Onondaga Community College's SRC Arena & Events Center in Syracuse, NY. This annual show combines the major fruit, flower and vegetable associations of New York State in order to provide a comprehensive trade show and educational conference for New York producers, as well as neighboring states and Eastern Canada. In years past over 100 presentations were given by Cornell Cooperative Extension personnel and highly regarded speakers from across the country. Panel discussions feature some of the top industry experts and growers in New York. Between educational sessions, attendees can visit the trade show featuring over 150 commercial vendors and non-profit exhibitors. Session topics include commodity specific programs in berries, cole crops, cut flowers, tree fruit, sweet corn, solonaceous crops, onions, root crops, vine crops, Christmas trees, hard cider, industrial hemp; and multidisciplinary programs in weed management, digital agriculture, soil health, biopesticides, ag labor, climate smart farming, marketing, pollinator health, high tunnels, and floriculture crops in greenhouse production. 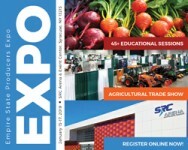 A Produce Safety Alliance (PSA) Grower Training will be offered too. DEC pesticide recertification credits and Certified Crop Advisor (CCA) credits will be offered during the appropriate educational sessions. View a printer friendly version of the program details. REGISTER NOW through the NYS Vegetable Growers Association. For registration help, call 585-993-0775.